I just wanted to pop in and say happy holidays from my family to yours. I am thankful everyday for this little slice of creative sunshine I call my blog. I hope your holiday season is filled with peace, love, health, and silliness. I love getting holiday cards in the mail this time of year, but the season snuck up on me and I didn’t get around to ordering ours until today! If you’re like me, it’s not too late! New Year cards are a great way to go. 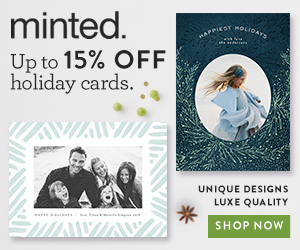 I chose this one from Minted and you can get 15% off right now. I also ordered a few photo gifts for grandparents. There are so many cute ideas on here!